AHHH! What a mess! It's so hard to fit it in, with FP real estate so packed these days! Just like my other idea, and for simplicity's sake NI, I would be PERFECTLY happy even if you had to set up the probes during edit mode, and were not able to "probe" while running. As a bonus, this idea may be extrapolated into n timing probes, where you can find delta t between any two of the probes. When you align a control that has increment/decrement buttons to other objects on the front panel that do not have them, LabVIEW aligns the buttons with the edge of the other controls. The align objects command should ignore the increment decrement buttons and align the border of the control with the borders of the other controls. Workaround: Hide Inc/Dec Buttons, align objects, Show Inc/Dec buttons. However not as convenient. Selection of Items on BD or FP needs to be Easier! All horizontal wires were selected down to "ABCDEF", even though just a very small portion of the visible wire was inside the selection box. It's not intuitive to try to not select wire that is hidden behind the Unbundle. Voila! Selection is now a TAUGHT SCIENCE instead of a LEARNED ART! The smaller footprint of the Local Variables in 2010 has increased usability of the IDE and readability of the LabVIEW language. Another node that could benefit from a smaller footprint is the User Event Ref Constant. Below is some conceptual artwork on what a smaller footprint might look like. Feel free to post more concepts! Once in a while I complain about font issues in general (here, here, or here), but one of the really weird things are the font sizes as used in LabVIEW. The font dialog lists them as units of pt, but for some reason they are quite different in size from the same sizes in any other applications (browser, word, etc.). 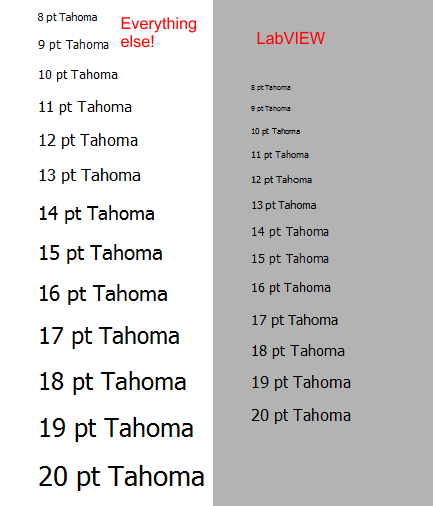 LabVIEW also shows other problems, for example tahoma 14, 15 all look exactly the same... why?? Here is a side-by-side comparison of a wordpad document and a LabVIEW panel. Each line is configured for the indicated font size. As you can easily see, LabVIEW is the exception. Any other applications I tried agrees with the left panel. Idea -->LabVIEW should also standardize here! Here's my Windows 7 taskbar with, among other things, LabVIEW 8.0, 8.5, 8.6, and 2009 icons. Which one is which? There are ways to tell, but it sure would be easiest if the version number were overlayed on the icon. Note the Visual Studio 9.0 icon in the taskbar...I think we should do something very similar with the application icons of future LabVIEW releases. I think structures should have a better label system. Currently I use free labels of the same color as the loop which looks great and makes the code easy to read and debug. But if I resize my loop I have to manually resize the label as well. I think this should be built into a right-click option. I would like the ability to probe the loop iteration terminal ("i" in For and While Loops) without the need to wire it to something (indicator, edge of structure,...). Currently, the block diagram has an endlessly useful feature. I use it every day - the Distribute Tool. The size of the Close Reference VI makes it impossible to draw a proper block diagram. It is too big! It does not match with the Property Node vi. Therefore I would propose: --> Make the Close Reference VI smaller! If you are not using the Data Event Terminals in an Event Structure, you might customarily hide them - roll them up so that only one terminal is showing. I would like to hide that remaining terminal. The idea is to not grey-out the Remove Element option when you are down to one terminal. That way, you can remove it. A stub remains to right-click on in order to bring the terminal(s) back if required. Currently if you right click on a subVI from the block diagram and choose properties, it brings up the Object Properties dialog. The only options you can change there are label options, which can easily be changed in the "Visible Items" submenu. I can't think of one time when this has ever been what I wanted out of this action. Instead, I think this action should open up the VI Properties Window for the VI.